Welcome to a brand new Science Sunday! This week is bitter sweet, while we are super excited to share another fun and easy science experiment with you, we need to take a short break. Don’t worry, we will be back to share even more fun and easy science experiments with you. 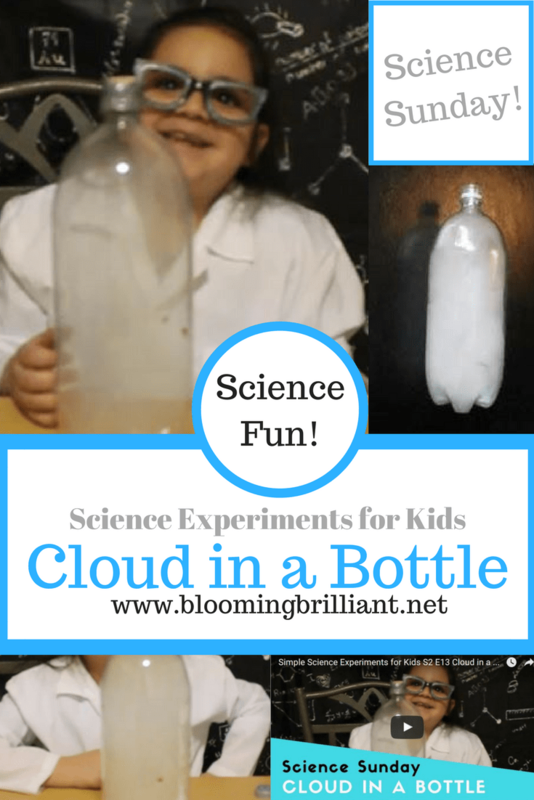 But, for now enjoy learning about weather and condensation with our Cloud in a Bottle experiment and check out all our previous experiments too! If you aren’t a subscriber of our Science Sunday Newsletter make sure you subscribe so you get a heads up when we are coming back with our brand new episodes. First fit your cork to the bottle. You may need to shave off the cork to get a tight fit. Your goal here is to get the tightest possible seal. Next trim the cork to the length of the bike pump needle. You want the needle to be able to pass through the cork and into the bottle, keeping a tight seal. Then you will make a path for the cork using a skewer, drill bit, or needle. Be sure the object you use to pierce the cork is narrower than the bike pump needle or you won’t have a tight seal. When the cork is ready take it out of the bottle. Pour a teaspoon of rubbing alcohol into the bottle and screw the cap back on. With the cap on, turn the bottle horizontal and roll it so that the alcohol sloshes around and coats the inside of the bottle thoroughly and evenly. Then, insert the bike pump needle into the cork. Then pump the bike pump 5 to 6 times. Sometimes when you do this the cork will blow off and you’ll have your reaction. Other times you’ll have to pump a few more times, then stop and pull the needle out. Make sure to aim the bottle away from you or anyone else. When it is pumped hard, the cork can shoot out and hit you or someone else. Before the cloud disappears, put the needle back in and pump a couple more times. The cloud should disappear as quickly as it came. Release the pressure and the cloud will re-form. You are mimicking the part of Earth’s water cycle in which evaporated water (water vapor) cools and condenses, forming clouds as they connect with dust. In this experiment, the alcohol acts like the dust, providing something cool for the water droplets to attach to. When you pressurize the soda bottle by pumping air in, the air molecules collide with each other and warm the bottle. 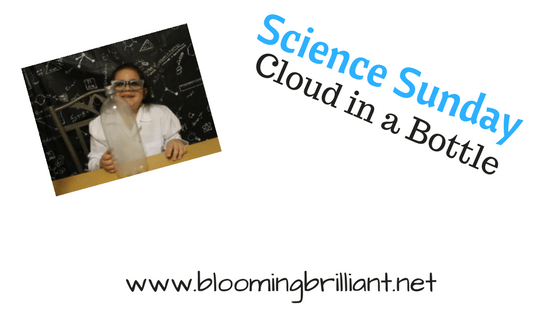 Releasing the pressure causes the water vapor to condense quickly, forming a cloud.